What&apos;s With the Green Screen? Maybe you’ve wondered why many of the experts in our videos have a green background. Its purpose is to allow your students to add a “special effect” by inserting an image or video. This technique is used to do weather forecasts on the news and to create special effects in feature films. The green screen effect is not just for the pros at the networks or in the film industry — it’s for you and your students too. 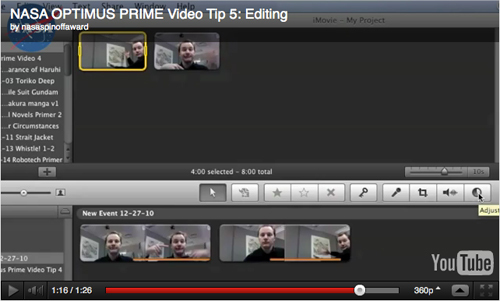 Check your video editing software to find how to do it. Some editing software comes with a green screen tool. Others require a plug-in application. Below are two examples of adding a photo background and a video background to a green screen interview. I am using clips and images from different modules. (Why not mix them when you can?) The clip is from the Colonel Mike Fincke video in the Exploration Careers module. The background image is from the Micro-g image gallery in the Fun in Microgravity site. The video background is from the Space Station video clips gallery. Just creating a podcast or video offers the opportunity to be creative, but students can be even more creative by adding special effects to their video podcast. With our newest module, Rocket Science, we are using a new video delivery tool. NASA’s Video Gallery now houses the videos. Instead of downloading a Zip file, you can download one video at a reduced file size. Reduced file sizes mean faster downloads and less bandwidth and storage space usage. This capability is perfect if your school has limited space for files. Another cool thing about the videos in the Gallery is that you can watch them on devices that do not use Flash players. So iPad and iPhone users can watch these videos now. Use a downloader app to put files on your device and a video editing app to build podcast episodes. You also can share them via a variety of social media. Here’s a tip for downloading: On some browsers, you need to right click the “Download Video” button to be able to name the files as you like. Windows XP and Vista users with MovieMaker should note that the videos download as mp4 files. You need to use a video converter to change the files from mp4 to .wmv files. Search the Web for a free converter. Be sure to read reviews to find the best. I hope this new video format opens up new ideas and possibilities of how you can use DIY Podcast videos. NASA is a sponsor of the OPTIMUS PRIME Spinoff Award. In this contest, students submit videos about NASA Spinoffs. A spinoff is NASA technology that is being reused in different ways. The Making Your Video page of the contest website has five videos with tips for creating a video. You and your students may use these tips as you create productions with DIY Podcast modules. Tip 1: Enough is enough! This tip discusses the ideal length for your clips. Tip 2: Get framed. Discover techniques on framing the subject of your video, including how to choose the best angle for and distance from the subject. Tip 3: What was that? Learn how to avoid audio issues, including background noise. Tip 4: Movin’ on. Get tips on transferring videos from the camera to the computer. Tip 5: Cut! Begin editing your video. Each video lasts less than two minutes but gives enough information to help even the novice video producer create a better product. Check out the OPTIMUS PRIME Spinoff Award site, and submit your video. Registration is open to students in grades 3-12, and the registration deadline is Jan. 3, 2012. Video submissions must be received by Jan. 17, 2012. TRANSFORMERS and OPTIMUS PRIME are trademarks of Hasbro and are used with permission. © 2011 Hasbro. All Rights Reserved. We’re wrapping up our blog series on using still images in video projects with a few production ideas for developing classroom projects with DIY Podcast materials. In the Sports Demo topic module, astronaut Clayton Anderson demonstrates sports in microgravity. He shows how it’s different to play ball or do gymnastics without the full force of Earth’s gravity. Your students could show the earthbound perspective by taking pictures with their digital cameras. It might be fun for your class to participate in the same sporting events that Anderson demonstrates on the space station. You could designate a few students to take action shots of their classmates playing baseball. Some of the students who play in the baseball game could serve as photographers for the next sporting event. By the end of your sports demo, all the students will get to shoot photos and play sports. With the use of transitions and special effects, your class could create a video product exclusively using still images. If you take that approach, you could grab still images from the Sports Demo video clips to draw a contrast between sports in space and on Earth. You could mix in some of the stills on the DIY Podcast: Sports Demo Images page. Or your class may prefer to capture video and just drop in still images for titles, transitions or special effects. Video should usually be created with moving video, but still images are well suited for some video production situations. In our last blog post we discussed how a lack of moving video prompted Ken Burns to rely on the pan and scan effect to bring Civil War photos to life. When video you need isn’t available, you may choose to incorporate still images into your video project. An occasional still image may help to smoothly transition from one scene to another. Using still images to make a video is sometimes faster, cheaper and easier than using live motion video. For example, it’s faster and easier to download an online image of Sir Isaac Newton than to have a student dress in costume to perform a vignette for a video podcast about Newton’s Laws. If you don’t have access to a video camera, your students can still build a video podcast or digital slideshow by creatively blending still images with text. The DIY Podcast activity provides images related to the topic modules. Once you find images suitable for your project, insert them into the timeline in the order you want and then add transitions, graphics and music. You could spice up the project by dropping in a few of the DIY Podcast video clips. Still images also make great backgrounds for project titles and are more visually interesting than a solid color background. You may want to manipulate the image in your photo editing software to give it a soft blur or some other effect before importing it into video editing software for inclusion in your project. In our next blog post, we’ll share some production ideas for using still images in video products your class creates with DIY Podcast materials. DIY Podcast topic modules feature images that you can use when building your podcasts, but you may occasionally wish to grab a still image from one of the video clips. A couple of videos that come to mind are Sunita Williams exercising on the space station, which you’ll find in the Fitness module, and Clay Anderson demonstrating sports in space, which you’ll find in the Sports Demo module. Most video editing software makes it easy to extract a still image from video. Depending on the software you use, the still image function may be listed as “Export,” “Make Freeze Frame,” “Extract” or “Take Picture from Preview.” You also may want to try a simple Web search for a free image extraction tool. Students can use special effects with still images to create supplemental video that runs with their narration. We’ll discuss some of the ways still images are used to create video productions in upcoming posts on the DIY Podcast Blog. The technique is used primarily when film or video material is not available. It gives life to still images by slowly zooming in on subjects of interest and panning from one subject to another. For example, if your students include DIY Podcast clips of an astronaut in their video project, they could use this effect on an expedition or space shuttle crew portrait. Your class videographer could slowly pan across crew members’ faces and settle on the crew member being discussed by the narrator. The pan and scan effect also can be used to transition from one scene to another. You can achieve this technique with a camera or with software that incorporates still images into a video project using slow pan and zoom effects. If you scan an image, it’s important to determine the right scanning resolution for your work. You need enough data in the scanned image to allow you to zoom in without causing the image to break into blocks of pixels, but you don’t necessarily need to go with the highest scanning density because the resulting file will take a lot of hard drive space and slow your computer processing. We’ll consider some of the benefits of using still images in video projects in our next blog post. How are you using still images with video in your classroom? Post a comment and share your experience. When you need supplemental materials for NASA-related lessons and activities, the Central Operation of Resources for Educators may be your answer. CORE serves as the worldwide distribution center for NASA-produced multimedia materials. You may purchase the materials for a minimal charge. Resources available from CORE include activity kits, CD-ROMs and DVDs, posters, and space memorabilia. The kits and memorabilia may be especially useful for student demonstrations in DIY Podcast video productions. DIY Podcast topic modules include downloadable video for students to use when creating their products, but you may be interested in an upcoming webcast that will offer tips for finding additional NASA multimedia to use in the classroom. The NASA Digital Learning Network will offer a free, interactive program at 4 p.m. EST on Nov. 18 geared toward educators looking for NASA video resources. Using NASA eClips™ to Engage Millennial Learners will guide participants through the NASA eClips Web site and demonstrate how to use the Teacher Toolbox. The site features short educational video segments designed to inspire students and help them see real-world connections. When students are searching for more information to build their products with the DIY Podcast activity, NASA TV is a good place to look. You can watch live events, including live space station video and mission coverage. NASA Television is a multichannel, digital service that includes the NASA TV Education Channel, which provides grade-level programming for teachers and students. You may refer to the NASA Television Education File for the monthly programming schedule. Much of the educational programming is theme-related. Monthly themes are listed at the top of the Web page, and a link to the previous month’s theme is listed at the bottom of the page. The education file also provides links to information on sources for viewing NASA TV, how to get digital NASA TV and a list of program descriptions. As you click through the educational programming descriptions, you’ll find links to CORE, the Central Operation of Resources for Educators, where you can order many of the videos. You’ll also find links to NASA eClips™ that are available for online viewing.